The 1966 Black Bat set was one of the first true trading card collector sets produced for the very popular Batman of the early 1900's. This iconic card is number one in that set. There are a number of variants available as many sets were licensed to international companies to be printed locally. As a result there are slight variations and different print marks on these individual cards. I will explore this further in future blog posts about the 1966 Batman cards. All cards feature the same image on the front however some have slight variations to the back. This card shows Batman becoming part of mainstream card collecting by flying through the air toward the viewing. As with all vintage cards check for damage due to age and poor centering. 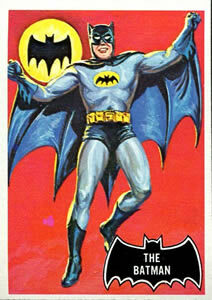 The 1966 Black Bat #1 card can be bought for a few to many hundreds of dollars depending on condition. This is certainly a card that will stand out in your collection - particularly if you are lucky enough to purchase a sharp, well centered copy! Check out the 66 Black Bat cards for sale page to see cards available to buy on eBay right now. Best of luck adding this beauty to your collection!